Review: When mild-mannered Martin Harvey (Martin Short) finds out that he has inherited a vintage yacht, he decides to take his family on a Caribbean vacation to retrieve the vessel. 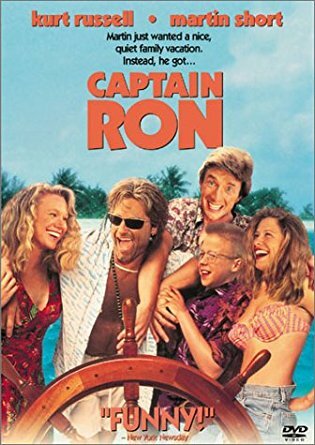 Upon arriving on a small island and realizing that the ship is in rough shape, Martin and his family end up with more than they bargained for as the roguish Captain Ron (Kurt Russell) signs on to sail the boat to Miami. It doesn't take long before Ron's anything-goes antics get the Harveys into plenty of trouble. Captain Ron may or may not be a cult classic depending upon who you ask. And it's definitely not a masterpiece by professional movie critic standards. But I would argue that every movie doesn't necessarily need to strive for that. This movie is fun, and it's supposed to be fun. Kurt Russell is fantastic as the titular character who is a living legend of sorts. Captain Ron imparts his wisdom or lack thereof with some hilarious one-liners, that might teach you a thing or two about life if you're not careful. Martin Short does a great job playing the neurotic father who spends the entire film trying to prove to his family that he's everything but neurotic. At the end of the day, this movie doesn't take itself too seriously, and nor should the viewer. Just sit back and enjoy as Captain Ron rambles about guerillas/gorillas, board game economics, and beer etiquette. Give Captain Ron a chance and I'm sure you'll find it's a rather enjoyable, heartwarming movie! Fun Fact: When the Harveys are coming into dock at the end, one of the boats being stacked is the "My Way." My Way was one of Paul Anka's biggest hits, sung by Frank Sinatra, among others. Paul Anka plays the boat dealer.